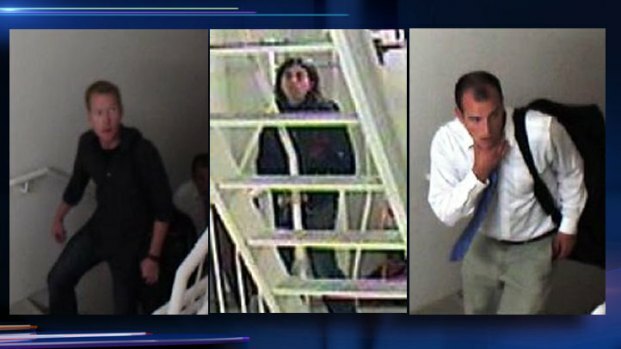 Chicago police on Thursday released surveillance images of three men they say jumped off Chicago's Trump Tower shortly after midnight. Three men who jumped from Chicago's Trump International Hotel and Tower early Thursday with parachutes wore flight suits and donned helmet cameras, according to a new report. A police report viewed by the Chicago Tribune notes a building staffer first noticed something awry while patrolling Trump's 91st floor. He found a pole on the stairway floor with a box taped to the end, according to the Tribune, and saw a padlock cut on the roof door. Police News Affairs could not confirm what the trio of BASE jumpers wore or the staffer's discovery. Police said Thursday the men used "a cutting device to gain entry" at 401 N. Wabash Ave. and then jumped from the building's highest point at about 12:30 a.m.
Police know what their Trump jumpers look like, and people familiar with high-flying jumps weigh in on the bold late-night escapade. Later in the day, police released surveillance photos of three white men in a stairwell of the building. One was wearing a dress shirt and tie and the others were wearing dark clothing. Police said there were no injuries. Trump Tower stands 1,389 feet on the Chicago River. The incident remains under investigation and police are looking for the jumpers, who could face trespassing charges if arrested.